The Debate - Teardown, scrub, and rebuild, or try something else. Nothing seems to have help. To make things worse, we've had an aptasia farm brewing for the last 6 months that I can't get under control either. I've tried multiple doses of Joe's Juice and even put a Copper Band into the tank. They continue to grow at an alarming rate. My next thought is to tear out the rock, frag the overgrowth, and start scrubbing everything down. It seems pretty drastic, but the aptasias are huge and everywhere. It's pretty frustrating and embarrasing given how successful our old systems have been. Any thoughts before I practically destroy the tank. Have I overlooked anything? Since no one else has responded I'll give you my thoughts. My tank is somewhat similar less the chiller, Ca reactor, refug, and the bigger skimmer. I had nuisance hair algae problem that was the result of overfeeding and slacking on water changes. The algae seemingly exploded within a week and I was losing the battle. I always have at least ~100 snails and crabs in my tank. In a 135 they seem to disappear but I know roughly how many I have. The first thing I did was a massive water change. I have 2 55 gallon barrels that I filled at the inlet with fresh saltwater. I know this isn't an option in Idaho but you can still make water. Then I shut the return pumps off and pulled everything from the sump and gave the sump and all equip a thorough cleaning. I had a friend help me remove the canopy and I removed all the piping from the internal overflow box. This was probably the most important part I cleaned as the amount of hidden Hair algae was incredible. I believe the crop of HA in the overflow was seeding the tank. So no matter how much I cleaned and vacuumed it was futile. I put everything back together and started on the water change. My water change works like this. I shut the return pump off. Siphon out the sump. Fill the sump with new seawater and start return pump. I let that water circulate for about 5 minutes and repeat. I leave the skimmer off during the process and have no filter media in place during the process either. The next step sealed the doom on the HA. I went to the keys for a short vacation and collected about 300+ snails of different types while there. After introducing them in the tank within days I could start to see a difference. It took about a month to rid the tank of 95% of the HA. There's still some minor spots that aren't growing and are slowly being depleted. Most of the original lot of snails have died and made homes for other critters but many remain and are still working. That was the HA scenario and that's pretty much done now. Knock on wood but I've never really had an aptasia problem but the choies are pretty clear there. Fish that eat them or manual removal. The few that I've had I've melted with Kalk in a seringe. This may be an option if you are patient. The question you need to ask yourself is why has your tank succumbed to the algae and aptasia. You can have all the flow you want in the tank, but if you don't have a good turnover flow from the tank to the sump and back your sump/fuge isn't able to help. 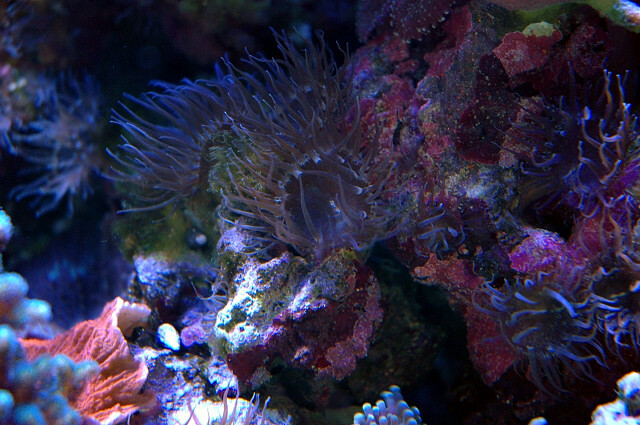 It could also be that as your tank has grown the water flow throughout the rock and corals has necome degraded. I've always noticed the few aptasia I've had are always in low flow shaded areas of the tank. So before you start the demo process try a good cleaning and maybe take another look at the water flow within the tank. Try changing the water flow direction and give parts of the tank a different current that maybe are lacking flow. Here's my 2 cents. I also had both problems. I increased flow....a TON. Changed brands of salt mix, added a remote deep sand bed, used a lot of carbon, bought a new skimmer.....that took care of the hair algae. For the aptasia I used Berghia nudibranchs but there is a "trick" to this IMO. You NEED to get them breeding outside of the main tank. I used a 10 gallon with a airstone and heater and used aiptasia covered rocks to feed them. I kept cycling the rocks, and apparently adding tons of eggs to my main tank. I had about 150 aiptasia in a 92 gallon tank........LONG story short they are ALL gone, every single one, for months they've been GONE. I also caught 30 Berghia (I bought 3) and sold them.........SO I MADE MONEY.......in fact someone just wanted to buy more from me.........Berghia WORK if you properly breed them first. BTW my phosphates are 0 as are nitrates after the remote deep sand bed.....it takes months but when they drop they drop fast. rynon- that is a very interesting way of introducing Berghia. I may actually attempt it. i was always afraid to use them because i heard they can poison an entire tank if they find their way into a powerhead. I have tried to use peppermints, but they didn't touch them at all. Um I believe I had a TON die in my tank.....unfortunate. I caught them in my overflow filter sock once the aiptasia were gone.....they float to find a new location. It worked so GREAT for me...I just wish I had some more I could send you. If you can get them breeding they work like a charm. You will be able to see the spiral shaped egg sacks under rocks....very easy to spot. Check out www.saltyunderground.com to check for compatibility with your fish and inverts. I made a $150 and some corals for the ones I sold. I work at a LFS and bought the 3 cheap, so it worked out great for me. Salty underground has great prices even compared to wholesale. It does take a LONG time for the aiptasia to disappear but I tried the same things you've tried. The nice thing is they eat the WHOLE aiptasia not just the top and then the aiptasia grow back.......when they're gone they're gone. Man I had a hard time getting rid of these dumb things.....I am thinking of setting up a breeding tank for Berghia...SUPER easy to breed in a small tank...just place them all together...simple. for the hair algae, have you tried the 3 day lights out trick discussed in another thread? that worked for me, and your tank looks much happier and healthier than mine. i'm not a real doctor, i just play one on tv. order some golf shoes, otherwise we'll never get out of this place alive. Thanks for the ideas everyone. I'll do a water change in the morning and start a 3-4 day lights-out cycle (Thanks for the link) and see where it gets me. If I could knock down the HA, I could re-focus on the Aptasias. Given the size of some corals, a break-down would result in a HUGE fragging party and some unkind words from my better half after seeing the results. I think the start of the problem was over-feeding and not enough clean-up crew. I added 75 blue-leg, 125 Cerith, and 4 emeralds a couple of weeks ago. They are working the sand bed and a few other areas. I've tried Peppermint Shrimp in the past and been very successful with them in our old tank, but the aptasias are too large for any shrimp to tackle. Hence the addition of the Copper Band, but he hasn't shown any interest either. I don't have any experience with the berghia nudibranches so I will need to start looking at them. We have a 20g quarantine system that can be setup in minutes if I can find some nudibranches. 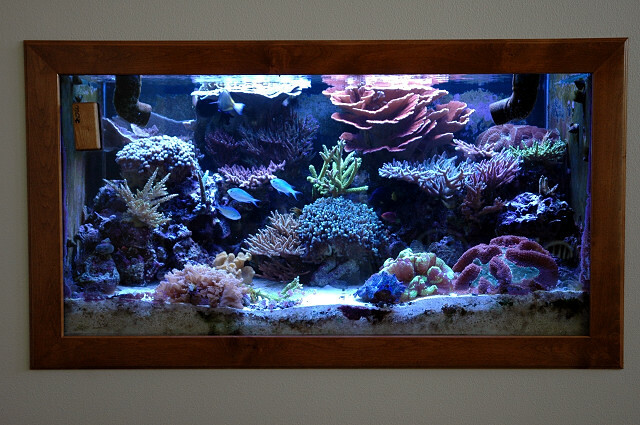 The one thing we have going for us is how the corals and clam look. 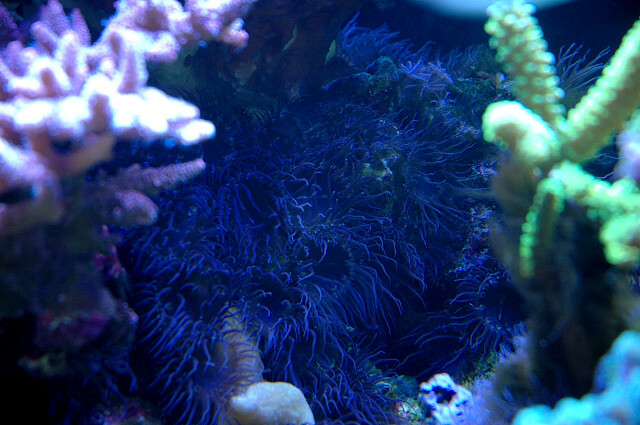 Polyp extension is great and the clam looks quite happy. The LPS brains are bigger than ever. Step 3 - Mix strong Kalk slurry and start injecting a zone at a time. Your "support room" looks very impressive and has a professional look to it. Good luck with the algae and aiptasia. Thanks Jack... It's a work in process. The "support room" is impressive. Good luck with the aiptasia fight. Sometimes I amaze even myself. I feel like I have TWO brilliant minds.